This is not something I usually do - recommend a book without having read it, but I have read their first book - RD Burman - The Man, The Music (Anirudha Bhattacharjee and Balaji Vittal) - a well-researched, well-written book that deservedly won a National Award, and enjoyed it very much. So when Anirudha, a friend of a friend, reached out to me asking if I would mind plugging their latest offering on my blog, I didn't hesitate. 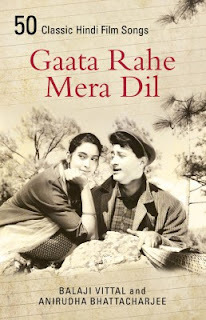 If Gaate Rahe Mera Dil is half as well-researched and well-written, it would be a great addition to anyone's library of books on cinema, particularly Hindi film music. And because it goes without saying that this book will eventually find a place on my bookshelf, right next to their book on RD, I have no compunction in recommending it to my readers, sight unseen. Gaata Rahe Mera Dil is available for pre-order on both Flipkart and Amazon. Believe me, I know the feeling! This one, I would like to get my hands on. It's only being released, Soumya. End-June, I think. I'm waiting for it as well. *Reading my post again, I see that it is not clear. Let me change that.